Chemical mixing tank is a container with an agitator for mixing, dispersing and reaction of different materials in chemical production. It is widely used in chemical, food, pharmaceuticals, resin, coating, paint, printing ink industry. It can be either dished end type or flat lid type, with level gauges, temperature detectors and display device. Usually, it has manhole, sight glass, feeding inlet, discharging outlet and spare openings. For different production process and reaction materials, we will have different designs and configurations, mainly displayed on its shape, overall size, sanitary requirement, seal effect, with condenser, heat exchanger, pressure sensor, temperature sensor and load cell. Various agitators and discharging modes for option. Type: Jacketed Reactor, Limpet Coil Reactor, Multipurpose Reactor with internal Coils. 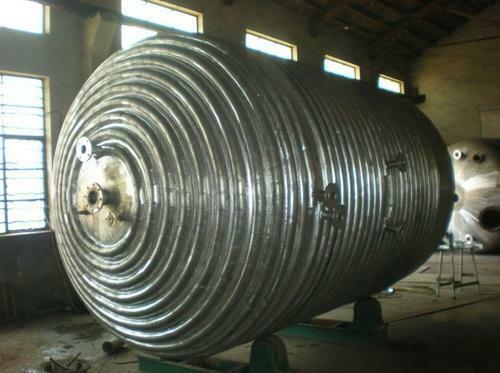 Capacity : 20 Liters to 20,000 Liters In AISI SS 304, AISI SS 316, M.S, MOC, in Standard & CGMP Model Construction. With M.S/ S.S jacketed & insulation with SS cladding. Direct top mounted stirrer with top dish / without top dish. Different type of stirrer i.e. propeller / pedal / anchor available.